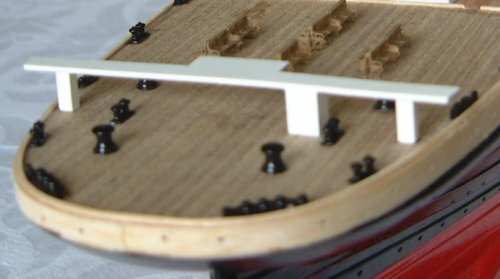 Week 60 This week we get some details for the navigation bridge and the stern docking bridge. Here are the bridge wing parts glued in place. I painted the parts before gluing them in place. With hind-sight this probably wasn't the best way of doing things. The edges are a bit rough and will need sanding down, and hence will need repainting. The little corner pieces which go down in C deck have been assembled, but I am going to leave them for the moment. They will eventually get small eyes fitted and I reckon it will be easier to fit those before gluing the parts in place. Here is the docking bridge fitted. I used short pieces of 1mm brass wire instead of nails. It serves exactly the same purpose, but is easier to drill. I used my paper template trick to mark the position of the small holes then glued it in place with Super Glue. The 1x1mm supports will be fitted after I've painted them. I plan to paint a length of wood, then cut it to size and glue in place. You can just see the 5 uprights in this photo. Fitting them was a bit fiddly. You can also see the lettering on the stern. I tried painting the word 'Titanic' before fitting it, but decided that it didn't work very well. Now that I've got the eyes (week 76) I can do these corner pieces. Firstly glue some 1x1mm strip on the bottom. Make sure you make a left and right hand pair, and you can let the strip stick out a bit proud of the edge. Cut down two of the eyes so that the stem is about 2 to 3 mm long, push it through the hole and bend the end over. Now glue it in place with Superglue. Note that the eye is at an angle of about 45 degrees. The I painted the underside to match the colour of the bulkwarks and lower bulkhead. Let the paint dry for several days before continuing as it will get some fairly rough handling when you carve it to fit and glue it in place. Now comes the tricky bit. These have to be securely glued as they have to take the strain of the rigging. 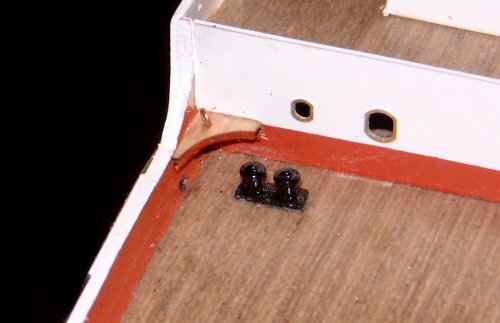 This means that to ourboard edge needs to be chamfered to match any slope on the bulwalk, and the aft edge needs to be perfectly flat to match the bulkhead. This is quite easy to do as long as you have a very sharp knife, preferable a new blade in your craft knife. When you've tried the parts in place and are happy that you have a perfect fit you need to scrape off any paint from the bulkheads and/or bulwarks. If you've used the card parts life is a little easier as the glue will stick to the card. The etchings need the paint removed. Now glue the parts in place. I used a thick superglue as I needed something that would stick to the brass. However, if you're using that card you could use white glue. This will give you a bit longer to get the part in the right position, but be careful you don't get excess glue on the card as it will mark it. Just to make doubly sure that it was well glued, I took some runny superglue on the end of a pin and let it run into the join. When the glue is completely dry (I wait overnight, even for Superglue) paint the top white. On my model you can see a couple of small scratches in the red - these will be touched in the next time I open the tin of red paint. You can buy 0.6mm drills from specialist model shops, some hardware shop (Dremel style accessories) and model engineering suppliers.